You can wander the stalls or eat well priced food in the Food Village. There are 9 different food stalls to choose from. The Tandoori hut and Tai hut serve Halal food. The market is indoors so you don't need to worry about rain. This is a really friendly market and there is always something new to see. They have a book and record market on the 1st and 3rd Wednesday of every month. On Saturdays and Sundays the market is really busy. There is an NCP car park about 220 meters away on Middlesex Street. Click here to see the NCP website. There is a large car park on Brick Lane at 93 Feet East (underneath the Truman Building). Parking between 6.00am and 7.00pm costs £6.00. Parking after 7.00pm to 6.00am costs £3.00. 67, 26, 43, 47, 48, 78, 149, 242 and 388 are the nearest mobility buses. (Hammersmith and City, Central, District, and Circle Lines) Liverpool Street underground station is about 250 metres from Spitalfields market. Liverpool Street underground station has accessible toilets but the underground service there is not accessible for wheelchair users. (Hammersmith and City, and District Lines) - Aldgate East underground station is about 500 metres from Spitalfields market. Aldgate East underground station is not accessible for wheelchair users. Bank station is about 1720 metres from Spitalfields market. Bank station is accessible for wheelchair users. Tower Gateway station is about 1330 metres from Spitalfields market. Tower Gateway station is accessible for wheelchair users. Liverpool Street mainline station is about 250 metres from Spitalfields market. Liverpool Street mainline station is accessible for wheelchair users. Call National Rail enquires for support on 0845 748 4950. 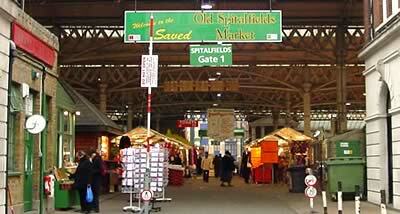 Spitalfields market is a landmark and sign-posted from Liverpool street station. All 4 sides of the Spitalfields Market building have very wide doors at pavement level. The market is in a very large building and everything is on the Ground floor. The stalls are more than 2 metres apart. The Food Village has chairs and tables. They are not fixed to the floor. There is an accessible toilet - it is kept locked. You can get a Radar key from the security office. The stall holders can tell you where that is. The minimum door width is 860mm. The market people are friendly and happy to help.